A Spanish restaurant in Shibuya, La Playa sets the scene as soon as you step in. Descend the staircase with its wine label-covered walls, until you arrive in the spacious, relaxed dining area that has the feel of a hidden retreat. Dry-cured hams dangle boldly over the counter, and books about Spain are heaped up in messy piles around the restaurant. 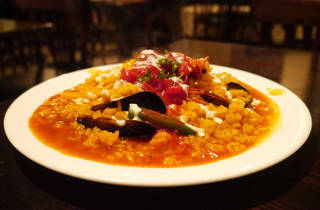 A popular dinner dish is the arroz con almejas, a white paella that's eaten in the Basque Country. 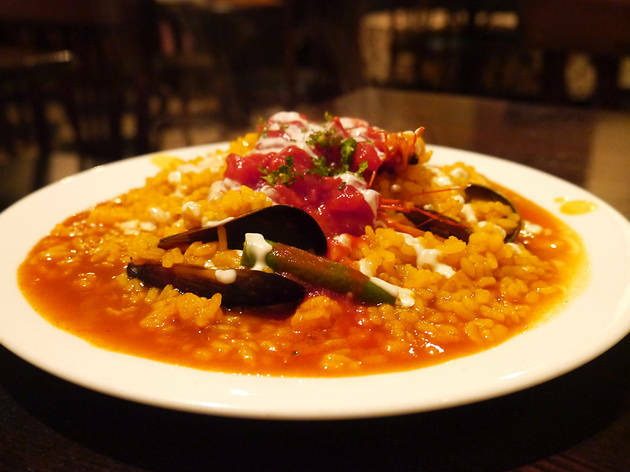 Unlike the typical paella which is made in an iron pot, this Spanish-style clam rice is cooked in an earthenware vessel, and packed with seafood. Lunch sets are available for an affordable ¥1,000, and include salad, soup and dessert, and a choice of tea or coffee. A good option is the Andalusia Lunch, which comes with caldoso – a tantalising rice dish made with generous helpings of mussels, shrimp, clams, squid and the like for a rich seafood flavour.